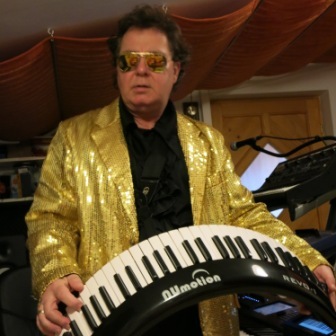 Dietmar Weber (Titus) is a keyboardist and one of the founding members of SUPERFREAK Musicgroup. This band is situated in Graz/Austria/Europe and performs wellknown Pop- and Discohits of the 70s and 80s. Weber studied classic piano for several years in Graz, where he was born, before switching to rock music (CHOICE OF BOYS), then to coverband-music (PURPLE AND THE GHOSTBUSTERS), back to german rock music (GEBRUEDER METTERNICH) and now to international Pop and Discomusic with the SUPERFREAK Musicgroup. As a keyboardist Weber recorded one studio album with GEBRUEDER METTERNICH and several live recordings with the mentioned bands in Austria. He is proud of being one of the first keyboardists in Europe to play the Numotion Curveboard to boost his live performance on stage.